Everyone at some point or another knows the frustration of lying awake in bed with a busy mind ticking away. 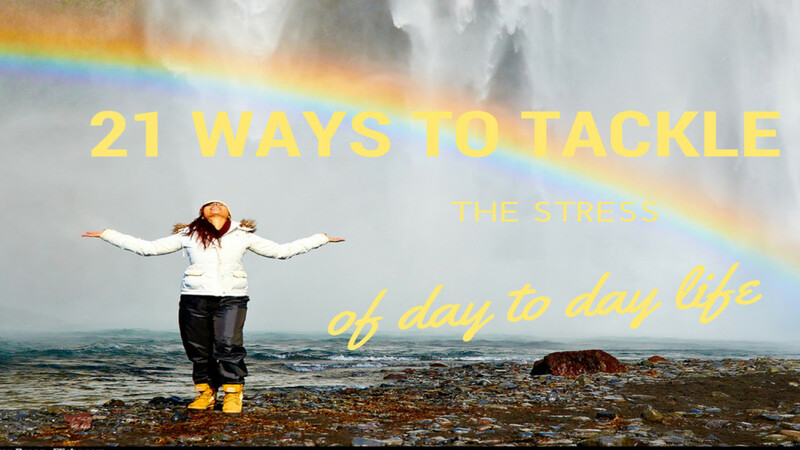 Whether it be an amazing idea, something you’ve forgotten to do, or a twinge of worry – these little niggles can keep you from drifting off no matter how relaxed or tired you feel. Adding stress to that equation will only make things worse and before you know it you’ll be staring at the clock at 3am wondering how many hours of sleep you can potentially get before the new day. A bad night’s sleep leads to even more stress, which can potentially lead to an even worse night sleep, so all in all it’s pretty important to break the cycle and fix the problem. Try some of these tips tonight for a night of sweet dreams. Set a bed time. One of the best ways of making sure that you have yourself a good night’s sleep is to get into a routine. Statistics show that our bodies are built for a sleep pattern of 10pm – 6am however, it’s not always that simple, so set a realistic bedtime that will suit your lifestyle. It is a well-known fact that 9 hours is the recommended amount of sleep, so use your morning routine to figure out your evening – but make sure you leave yourself a good 15 minutes to fall asleep. Choose your snacks wisely. For some reason most people believe that snacking before bed is a no-no, however, a light snack before bed can in some cases help you to sleep. Foods such as turkey sandwiches, whole-grain cereal, granola and bananas have been proven to calm the brain. No electronics. We know how tempting it is to check your email or Twitter just one last time before you shut your eyes for the night, but the blue light from screens disrupts your brains ability to feel sleepy. Avoiding bright screens within 2 hours of your bedtime isn’t necessarily ideal but if you’re in desperate need of those Z’s and are sick of counting sheep, it may be the way forward. Caffeine is not your friend. Busy schedules love coffee, it’s just the way it is, but caffeine can stay in your system for up to 14 hours after consumption. If you seem to be having trouble sleeping try and remove caffeine from your diet for a few weeks replacing it with water or herbal tea and see if you can spot any improvements. Break a sweat. It has been reported that regular exercise can help you to sleep better and feel more energised throughout the day. It doesn’t need to be a high intensity work out, low-impact exercises such as yoga or walking can speed up your metabolism leading to improved sleep quality. Have a soak. Having a bath before bed can really help to reduce stress levels and relax the body. A hot/warm bath with lavender extracts for around 20 minutes is a great idea – adjusting your body’s temperature to a point that signals your brain that “It’s time to snooze!”. Stay asleep. If your waking up during the night the likelihood is – something is catching your attention whilst you’re in the lighter part of your sleep cycle. Try cutting down on your liquid intake before bed to prevent you from needing to use the bathroom mid-sleep, or invest in some dark curtains to block out any natural light entering your room. We hope this helps and you’re full of beans in the morning! Since starting up in 2010, Pinterest has gone from strength to strength. Nowadays, many businesses both small and large are choosing to venture in the world of Pinterest, using the social platform for both personal and business use. When I first started to use Pinterest from a business perspective, I will admit I was more than a little sceptical. How can Pinterest, a platform that allows its users to pin images to a virtual pin board, be any better at driving website traffic than its older cousins Facebook and Twitter? Well, in a nutshell, Pinterest allows you to open up your business to a whole new range of potential clients and customers. Not only can customers re-pin what you have pinned to one of your boards, but you can also add your company website to each pin so that potential customers can access it, no matter where the original pin ends up! That’s great but… is there anything I need to remember when I’m using Pinterest? As with all social media platforms, Pinterest has it’s very own quirks and differences that make it stand out from the rest. Don’t worry, however, because with these facts and tips you’ll be well on your way to Pinterest greatness! Before you begin to pin, you need to double check that your image fits with the Pinterest requirements. The standard requirements for a large thumbnail on a board is 222 x 150 pixels. For the smaller thumbnails this is reduced to 50 x 55 pixels. Add your company website to your description. Make sure that your customers can get to your website easily by adding a link to your description at the top of your Pinterest page. It is also essential that you add your website link in each pin description too, this makes it easier for Pinterest users to find your website even if they don’t have time to visit your main Pinterest page. 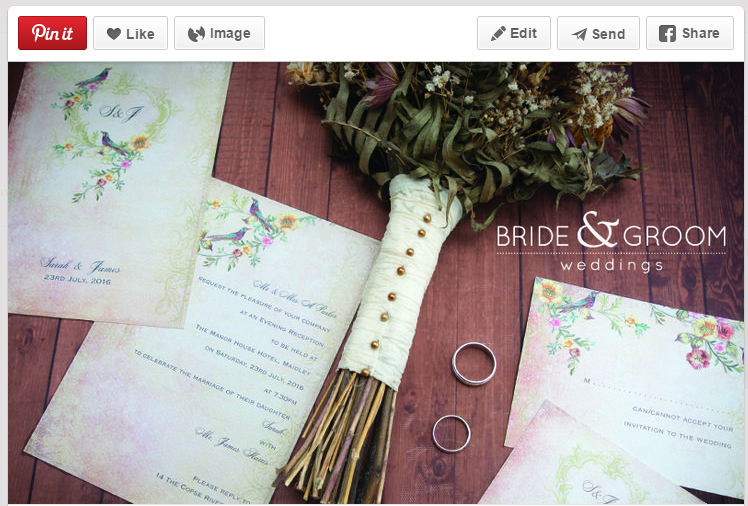 Add a hover ‘Pin It’ button to your images. Adding a hover ‘Pin It’ button to your images allows your customers to add images from your website to their own Pinterest boards, which is a great way to get your content out there! Click here for Pinterest’s very own easy to follow instructions on setting up your own hover ‘Pin It’ button. Want your image to be clicked on more? Use a skinny pin! ‘Skinny pins’ are long, skinny images that require the user to click on them to see the full picture. Using these types of pins piques the user’s curiosity, so don’t be afraid to add a long, thin infographic to your board every now and again! Take note of the best times to pin. 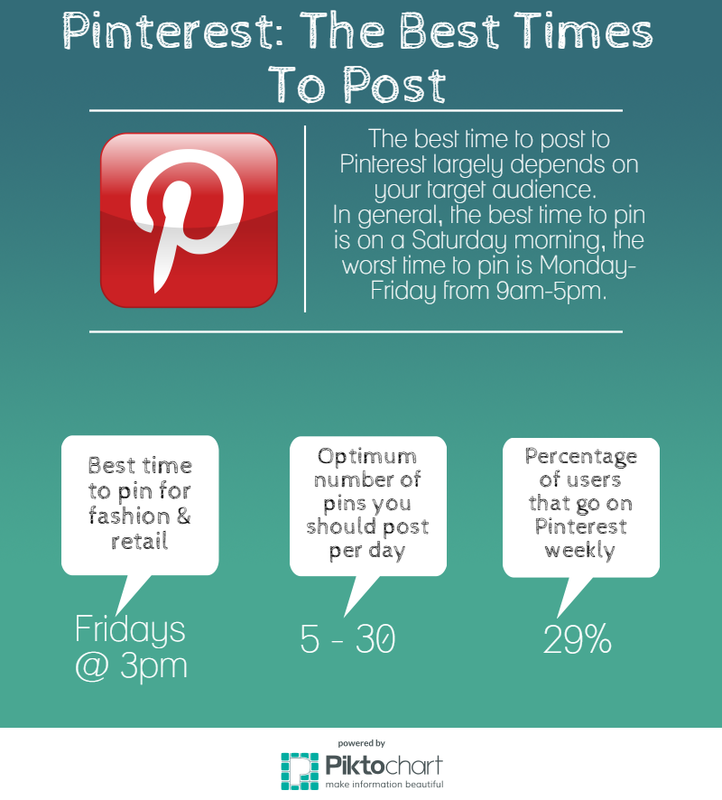 Like any other social media platform, Pinterest has optimum times to post. Adhering to these times as best you can gives you are higher chance of getting noticed! Adding a watermark or logo to your original images not only makes them look more professional, it also means that the image can always be linked back to your brand and website. Rich pins enable you to add topic-specific descriptions to the pin itself, making it quicker and easier for your target audience to get the information that they need. Rich pins currently come in five categories: film, recipe, article, product and place and are a great way to really connect with any potential customers by understanding their needs. For more information on rich pins, click here. Remember that the majority of Pinterest users click on blogs & articles rather than retail sites. Pinterest is, primarily, a place where people can go to look at things that interest and excite them. It is important to remember this when you are deciding what to pin from your website. Pinterest users want content that is going to inspire them and, yes, this could be your latest product. However, the most clicked on pins are content based ones such as blog posts or articles so it is worth keeping this in mind. Invite others to a group board. When creating a group board, think about what your customers would be interested in that you can create a (not so) little Pinterest community around! Create appealing content that you can pin. Content on Pinterest should be a good combination of original and found content. Above all you should be looking to pin content that you think will be useful to your customers. 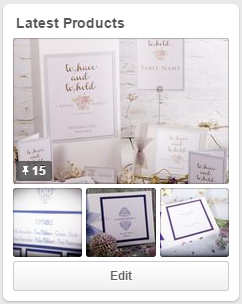 So if you are a wedding business, for example, creating a pin board for bridal hair & make-up tips is something that your customer base would find useful and interesting. Keep in mind how long Pinterest users spend pinning. 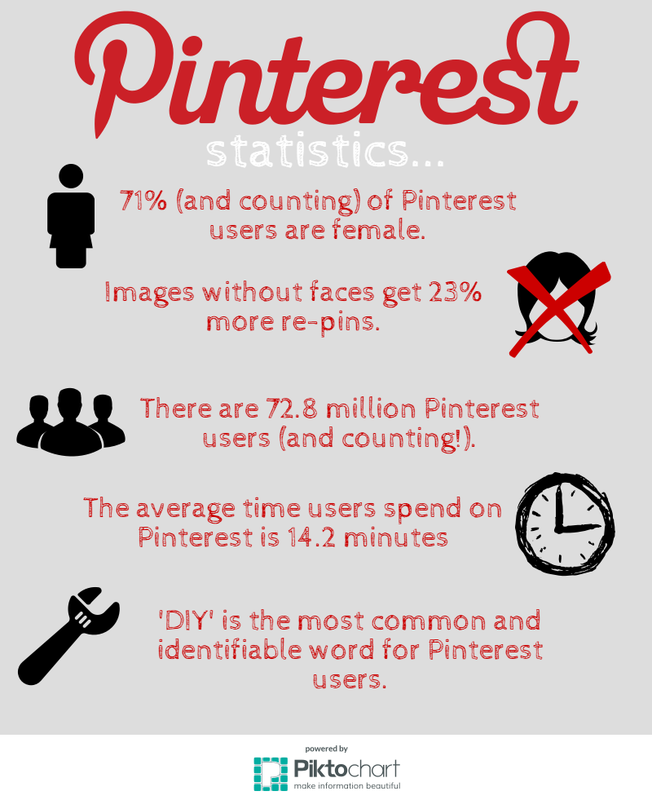 The average Pinterest user spends just 14.2 minutes pinning content that they think is useful to them. Make sure that your pins have impact so that you can make the best impression in such a short space of time! Pinterest as a business is going from strength to strength, so don’t be afraid of using it to enhance and expand your potential customer base! If you have any questions regarding Pinterest, or you have some Pinterest tips of your own that you would like to share, let us know in the comments! For many businesses Christmas can be the make it or break it season. The rise in Christmas shoppers offers the perfect antidote to a tough year in sales and it’s important that every avenue to increase sales is explored and utilised to maximise sales. Yet, with the huge increase in customers during the Christmas season there is also a huge increase in competition. More businesses than ever before are depending on Christmas to keep their business afloat and the competition to grab every last sale is growing into a fierce fight. Thus making sure your marketing is top notch and is resonating with every single customer has never been more important. One element is simply making your advertising materials, like flyers or posters, that bit more appealing to the average Christmas shopper. One question we keep getting asked here at 123Print is, ‘Where can I find Christmas fonts to use in my artwork designs?’ Well, after recently releasing our very own font Debbie (and seeing as it’s Christmas) we have chosen 6 of our favourite Christmas or seasonal fonts, all of which can be downloaded and used for free. A little gift from us to you. Jump straight into your Christmas advertising designs with this Santa Air Mail font. Offering a quirky 3D design, this font brings a little winter scenery to your design by adding a little snowfall to each letter. Terms- Free for personal use. For commercial use please contact creator. The Candy Cane is an iconic image of Christmas and this Candy Cane font is sure to awaken your customers’ sweet tooth. Add this font to your Christmas marketing designs and you are sure to pull in the Christmas shoppers. Will it be a white Christmas? The news seems to think so! Give your Christmas designs the chills with this elegant Christmas flakes font design. This tidy script design uses both large and small snow flakes to tie up a wintry font. Whether you love it or hate it, snow is an iconic image of Christmas and you can get your marketing designs in the jolly mood with this Christmas Flakes font design. Perfect for businesses looking to stay in Santa’s nice list, this font uses a little snow design on each of the letters and also has flakes falling throughout the lettering. Put the final touches to your Christmas marketing with this super fun Ornamental font design. Using (you guessed it!) Christmas Ornaments and baubles as the outer of the design, this font has a quirky fun-like lettering inside of each bauble. For a different type of target market this Dickensian font is less Christmas tree and more aged design. We can see this design being perfect for a customer base of over 40 years of age, as it uses a smart holly design round each of the Dickensian designed letters. Call it work, call it a tight economy, call it the simple pressures of modern life; but whatever you call it, it’s undeniable that stress in our society is growing at an unprecedented rate. As of 2013, in the UK, a record 13.4 million (yes, M.I.L.L.I.O.N) absences from work were attributed to stress. It’s estimated that as a result this cost the UK economy over £6.5bn and that stress is responsible for 1 in every 4 ‘sick’ days. Astonishing numbers.